I pledge allegiance to the flag of the United States of ..
From time to time I have turned my mind to the question of what is “patriotism”. “Patriotism” is NOT blind loyalty to a government. “Patriotism” is NOT blind obedience to a government. “Patriotism” is NOT the mindless retention of U.S. citizenship. I came across a fascinating article about the Pledge of Allegiance and its origins. 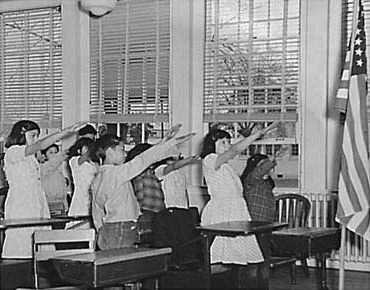 Stand Up for Liberty by Sitting Out the Pledge of Allegiance http://t.co/yk4KPzGYTW – What does the salute remind you of? Regardless of the outcome — so far, such challenges have ultimately been unsuccessful — the larger issue the case raises is the appropriateness of a pledge of allegiance of any kind in a liberal democracy. It never ceases to amaze me that, day after day, otherwise rational parents allow their impressionable young children to partake in a ritual so rooted in conformity that it seems inimical to the principles of freedom and individualism that underpin our country. And yet, in public schools across the nation, millions of young children are lined up authoritarian style, told to face an American flag dangling somewhere in the room, and are then expected to profess their allegiance to it — and of course to God as well — using words that many are too young understand in the first place. I suspect that most parents assume the pledge has a long and dignified past, that it’s part of the American fabric, and are therefore willing to leave it unchallenged. However, its history is not nearly as long or distinguished as people might think. In December of 2012 the Toronto Globe and Mail had an interesting piece on the pledge . It will explain the unusual salute in the above picture. You will be surprised to see why the salute was changed. A fascinating history of the pledge is here. This entry was posted in Land of the free, Renunciation, U.S. democracy, U.S. freedom and tagged Pledge of allegiance on April 4, 2013 by renounceuscitizenship.